Quaggas, partially striped zebras from the Karoo, were a distinctive component of the South African fauna. They had dark stripes on their faces, necks and fore-bodies. Otherwise their bodies were unstriped, and the background colour of both the striped and unstriped upper parts of their bodies was chestnut. They were hunted extensively, and in the nineteenth century were increasingly excluded from grazing land and water. The Game Amendment Act of the Government of the Cape of Good Hope was intended to protect quaggas, as well as other fauna, but by the time of its passage in 1886 they were already extinct. Quaggas were given the binomial name Equus quagga in the eighteenth century and many viewed them as a species distinct from plains zebras. However, in 1984 the first DNA sequencing of an extinct organism demonstrated that quaggas were not a separate species but a subspecies of the plains zebra. This revised taxonomy made possible the Quagga Project in which selective breeding from plains zebras has resulted in animals termed 'Rau quaggas' whose bodies have reduced striping but which lack the chestnut background colour that is evident in most paintings of living quaggas. Rau quaggas now live in captivity in several locations in South Africa, and could help restore the ecology of damaged environments where quaggas once roamed. Both quagga DNA and the Quagga Project can be considered as 'boundary objects' that bring together a heterogeneous variety of stakeholders including scientists and hunters, nature lovers and commercial organisations. The successful micro-politics of the Quagga Project in negotiating with different bodies and in obtaining funding from diverse sources provides a model that could be emulated by conservation bodies. Three types of zebras existed in South Africa in the mid-nineteenth century.1In the southwest of the Cape Colony lived Cape mountain zebras. Plains zebras -formerly known as Burchell's zebras - were present in the north and east of the country. South of the Orange and Vaal rivers and especially in the Karoo (Fig. 1) were quaggas, whose range overlapped with that of Cape mountain zebras. Mountain zebras and plains zebras survived while quaggas went extinct but have been restored, after a fashion. In place of black stripes against a white background in most zebras, the face, neck and fore-body of quaggas had dark chestnut stripes against a lighter chestnut background (Fig. 2). Behind the shoulders, the stripes often broke up into spots or blotches and then were lost altogether as the contrast between the stripes and the background colour lessened progressively, giving the upper part of the hind-body a uniform chestnut tone that faded into the white of the unstriped legs and belly. Descriptions of living quaggas and preserved skins refer to the background colouration as being brown, dark brown, fawn, chestnut, pale red and reddish-brown.5The chestnut background colour was a defining feature of quaggas: it is conspicuous in the quagga painted by Edwards in 1751 that serves as a type specimen (representative example) of quaggas for Gmelin's 1788 description of Equus quagga, where his Latin diagnosis refers to the colour as 'castaneus'.6 The red colour is also visible in paintings by Nicolas Marechal (Fig. 2), Jacques-Laurent Agasse and Samuel Daniell.7Although the background red colouration is more muted in Harris's paintings of quaggas,8 Bryden criticised this representation and noted that quaggas had a 'considerably darker' colour.9 Photographs of mounted quagga skins from museums show a brownish or reddish-brown background on the upper parts of their bodies. Because taxidermy specimens fade,10 it is reasonable to believe that the coats of living quaggas were even redder than these museum specimens. The large scale of hunting wildlife in southern Africa has been well documented.19 In South Africa populations of zebras suffered terribly from this assault: by the 1930s less than one hundred Cape mountain zebras survived, and plains zebras were extirpated from a long swath of their range. But it was quaggas that suffered most. Nimrods such as Cornwallis Harris shot quaggas20 and other 'game' in large numbers; sometimes they saved the hides and gave the meat to servants, but often carcasses were left to rot on the veld. It is not known precisely when quaggas became extinct in the wild, although most authorities consider that this occurred in the 1870s. Their absence, however, caused concern and so (on 6 July 1886) the Government of the Cape of Good Hope passed the Game Amendment Act. Section 4 reads, 'No person, however, shall be at liberty to pursue, shoot, kill, destroy, or capture any elephant, hippopotamus, buffalo, eland, koodoo, hartebeest, bontebok, blesbok, gemsbok, rietbok, zebra, quagga, Burchell zebra or any gnu or wildebeest of either variety, without having obtained a special permission to that effect from the Governor'.30 The passage of this Act was too late for quaggas, however, as the last had died in the Amsterdam Zoo on 12 August 1883. What remains of quaggas are 23 mounted skins (only one of which is in South Africa), a mounted head and neck, 7 skeletons and various bones including 13 skulls that were not part of skeletons.32 It is not certain, however, that all the skulls belong to quaggas, as quagga skins were sometimes mounted on the skeletons of donkeys or horses.33 Our knowledge of quaggas is based on these artefacts (some of which have provided DNA for analysis), together with paintings and illustrations, several photographs taken of a mare in the London Zoo, and the accounts of people who had observed these animals. Extinction brought value to quaggas. Reports of a quagga's skull valued at £25,000 in 1952 and a mounted plains zebra head offered for sale as a quagga's head in 1974 suggests money to be made from quaggas, genuine or not.34 Reports of quagga sightings into the mid-twentieth century in remote areas of South-West Africa (Namibia) were erroneous, but led to Lutz Heck, director of the Berlin Zoo, receiving an offer in the early 1950s to show him a herd of quaggas for a fee of £70, with all expenses refunded if the quaggas proved not to be genuine.35 The value accorded to a skull or mounted head might have inspired creative taxidermy, as in this extract from a 1935 letter sent by a London firm of taxidermists describing how they could simulate a quagga skin. There are no records of this sleight of hand being put into effect, but it speaks to the importance of South African identity - whether of a quagga or of a faux quagga. Might quaggas be restored by means other than 'stains and careful scorching'? For most of human history, selective breeding for particular characteristics was achieved without knowledge of genetics: breeding stock was selected according to its phenotype, usually its visible characteristics. In the mid-nineteenth century Gregor Mendel conducted his famous experiments on inheritance in peas, which demonstrated that traits such as seed colour were under control of genes that existed in alternative versions later termed 'alleles': a seed would have, for example, a yellow seed coat or a green seed coat depending on which alleles for coat colouration were present in the nuclei of its cells. Most definitions of species include the criteria that they are natural populations of organisms able to interbreed to produce fertile offspring,46 but these criteria are not useful in this instance as there are neither records of quaggas and plains zebras breeding, nor records of them failing to breed. Without these data, could comparative morphology answer the questions about species status? The most striking morphological characteristic was, of course, coat colouration. Based on this feature, both Boddaert and Gmelin recognised quaggas as a species separate from the plains zebras,47 and this view persisted among some biologists until late in the twentieth century. 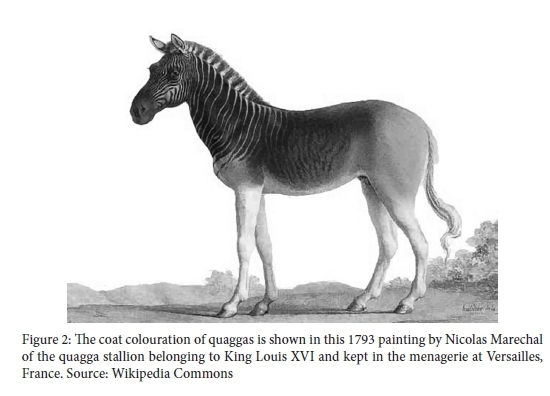 Clearly, there were very different views of coat colouration and so this feature could not resolve whether quaggas were a separate species or merely the least-striped plains zebras. Might other morphological studies resolve this issue? Careful comparative studies of skull morphology, however, yielded conflicting conclusions. Analysing 23 cranial dimensions from four quagga skulls of undoubted provenance, and comparing these dimensions with those from skulls of various Equus species, Klein and Cruz-Uribe determined that plains zebras and quaggas differed to approximately the same degree as plains zebras and mountain zebras.53 As the latter two are regarded as separate species, these findings argue that quaggas might be a different species from plains zebras. This conclusion was in contrast to measurements showing a closer resemblance between quagga skulls and plains zebra skulls than between quagga skulls and mountain zebra skulls.54 Studies of dentition provided starkly different conclusions even when conducted by the same scientist: in 1988 Thackeray concluded that quaggas may have been a subspecies of the plains zebra, whereas in 1997 he determined that mountain zebras and plains zebras were more similar to each other than either was to quaggas.55 It is noteworthy that four morphological studies with different conclusions were published after the molecular studies described below that, for most scientists, decisively answered the question of quagga taxonomy. DNA sequencing convinced taxonomists that quaggas and plains zebras belong to the same species, Equus quagga. In these circumstances, the International Code of Zoological Nomenclature can be used to make corrections to taxonomy using priority as a guiding principle. Because Boddaert and Gmelin had given valid descriptions and a binomial name for quaggas before plains zebras were given their binomial name in 1824,68 the name Equus quagga had priority and, as a result of these DNA studies, is now accepted as the binomial name for all plains zebras, including the lesser striped subspecies of the Karoo69 (the other species of zebras, Equus grevyi and Equus zebra, are unaffected by this reclassification). The experiments by Higuchi and his co-authors had a significance which went far beyond quaggas. The demonstration that intact DNA could be obtained from tissue that had been dried and stored at room temperature for more than one hundred years showed that DNA has a remarkable resistance to harsh treatment and could be recovered from very old specimens; for example, DNA from a horse bone that was 560,000 to 780,000 years old and that had been preserved in permafrost has been sequenced.72 By the late twentieth century, research in molecular biology was increasing at the very time that research in taxonomy, already an old discipline when Linnaeus transformed it in the eighteenth century, was declining. Now the old and new sciences were brought together: the science of paleogenomics was born, and a new term, aDNA, for ancient DNA, was coined. Base sequences from ancient DNA can be compared with DNA base sequences from living organisms to throw light on evolutionary history. 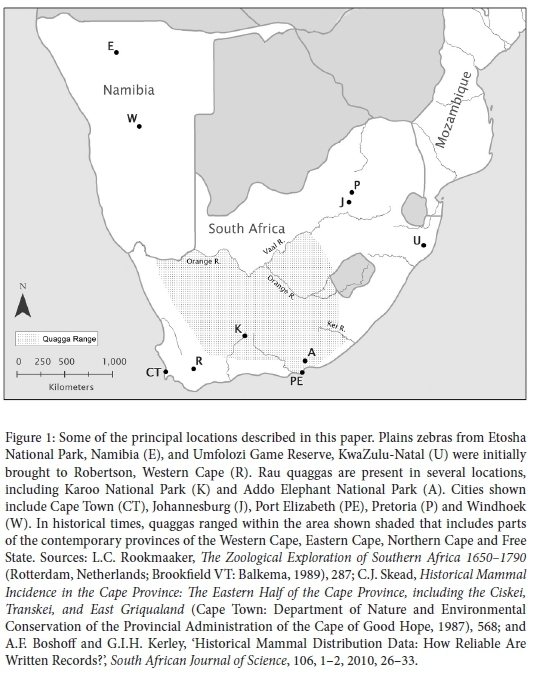 Such studies have shown that plains zebras originated about 1.1 million years ago, and that quaggas diverged from other plains zebras as little as 233,000 to 356,000 years ago.73 During this period the climate of the Karoo underwent major changes,74 which would have altered its environments and might have selected for the coat characteristics of quaggas. The tide turned, however, when it became known that DNA and protein analysis of quagga tissue indicated that quaggas were conspecific with plains zebras. Additionally, J.F. Warning, a retired veterinarian from Somerset West who was knowledgeable about horse breeding, rallied support for Rau's cause. This led to a meeting in 1985 between Rau, scientists from the University of Cape Town and officials of Nature Conservation, who were encouraging about Rau's proposals to restore quaggas and even offered accommodation for the zebras at the Vrolijkheid Nature Conservation Station belonging to the Cape Department of Nature and Environmental Conservation near Robertson, Western Cape. Further success followed on 20 March 1986 when Rau and five others met with M.A. Cluver, director of the South African Museum, when it was agreed that the South African Museum would support 'The Quagga Breeding Programme', later named the 'Quagga Project'.79The seven people present at the 20 March 1986 meeting constituted - together with Warning and Harley, who were not at the meeting - the 'Quagga Experimental Breeding Committee'. Beginning with animals chosen for their reduced striping, selecting the least-striped of their offspring for further breeding, and repeating this selection in subsequent generations has led to fourth-generation progeny with reduced striping of the legs and hind-bodies when compared to the founder population,85 but with no significant reduction in striping of the necks and fore-bodies. A fifth generation foal was born on 10 December 2013 (Fig. 4), but it is too soon to know if coat colouration in the fifth generation will differ significantly from that in the fourth generation. As of February 2015, the Quagga Project listed 119 animals at ten locations. The Quagga Project, which has been a Section 21 non-profit company since 2008, registered the name 'quagga' as a trade and certification mark to prevent others from profiting by producing quaggas.86 The Quagga Project now refers to restored quaggas as 'Rau quaggas'. This name acknowledges Rau's central role in the restoration of the animal and also serves to distinguish the animals from extinct quaggas. This is important, because populations of Rau quaggas have some different characteristics from populations of extinct quaggas; for example, the dimensions of cranial bones differed between extinct quaggas and extant plains zebras.87 In the absence of selection for cranial bone dimensions, it is reasonable to assume that the dimensions of these bones in Rau quaggas will resemble those of the plains zebras from which they were derived, and will differ from those of extinct quaggas. Other differences probably existed between Rau quaggas and extinct quaggas. Quaggas evolved in the arid conditions of the Karoo for at least 233,000 years88 and so may well have evolved adaptations that differed from those in the plains zebra. This possibility had been suggested in 1951 by B. Lundholm, who observed that restored quaggas would be similar only in coat colour, not in physiology.89 The point was later made more dramatically: 'Just because a man may look like Napoleon, that does not make him Napoleon. '90 The Quagga Project, however, counters this criticism by noting that, 'since extant Plains Zebras occupy habitats of similar degree of aridity to those of the Quagga, there is no sound reason for proposing significant adaptive features of the Quagga to its original habitat'. There was not, however, a single 'original habitat': the Karoo occupies more than one quarter the area of South Africa and over its extent it varies in both topography and climate with annual rainfall decreasing from approximately 500mm in the eastern Karoo to below 100mm in the west.91 Even more significantly, these habitats have varied over time: there were periods when the whole region was drier and colder than at present. For example, about 21,000 to 16,000 years ago which corresponded with maximum glaciation in Europe, temperatures were 5 to 6 degrees Celsius cooler in the Karoo than at present, while from 7000 to 6500 years ago temperatures may have exceeded those of the present. Precipitation varied too, with heavier rainfall from 16,000 to 13,000 years ago causing a lake to form east of Kimberley.92 Recent evolution of animals has occurred in environments that have always been changing,93 and this is certainly true for quaggas of the Karoo. It is possible that quaggas evolved adaptations to these former conditions and so had selection for alleles that are not present, or only at low frequencies, in other subspecies of plains zebras. Is it accurate, then, to state that Rau quaggas have the coat-pattern characteristics of extinct quaggas? Evidently, this question has been considered because the Quagga Project website in referring to a photograph of 'one of our better third generation animals' notes, 'The background brown colour is not so well developed as in either museum example [these examples were the mounted quagga skins at the museums in Munich and Tring, featured in Fig. 3], but this is such a variable feature in the museum specimens (of which there are 24 in all), that this is only a secondary concern for the project. '103 This wording is a noteworthy shift from a, 'chestnut basic colour' being a 'quagga characteristic' in the 2005 Quagga Project Management/Action Plan to the statement that a 'brown colour' is 'only a secondary concern for the project.' The issue of background colour is addressed in a somewhat different way in a recent paper: 'The background colour, being so difficult to quantify in both museum quaggas as well as living project animals, will not be a defining criterion for the term "Rau quagga", but will continue to be an objective in the breeding process, and animals with the darkest background colouration will claim priority in the ranking of Rau quaggas. '104 This is a reasonable conclusion, and it is to be hoped that the attractive chestnut coat colouration can be achieved in future Rau quaggas. Changes in coat colouration could have conferred an adaptive advantage on quaggas, as discussed earlier, or they may have occurred as a result of random genetic drift - a process that has been postulated to drive some evolutionary change105- or through a combination of the two.106 Common to all these possibilities are the requirements for alleles that will confer a chestnut colour to the body. The assumption behind the selective breeding of Rau quaggas from plains zebras with pronounced brown shadow stripes appears to be that the alleles producing shadow striping are the same as those that produced the chestnut background colour of quaggas. But suppose that this is not the case. If a mutation in an ancestral population of quaggas gave rise to the chestnut background colour of their bodies, then alleles for the chestnut background coat colour will not be present in extant plains zebras unless this mutation has also occurred in them, or unless there was interbreeding between ancestral populations of quaggas and other southern populations of plains zebras. The possibility of such interbreeding has been suggested: colder conditions in the past that led to expansion of grassland communities would have affected the distribution of ancestral populations of zebras - possibly resulting in quaggas occurring in the same habitats as other plains zebras.107 Such intermingling could have allowed the differentiating populations of plains zebras to interbreed, resulting in gene flow between ancestral populations of quaggas and other subspecies of plains zebras.108This possibility was also suggested by Rau, who observed that, 'It is likely that the quagga population was not totally isolated from adjoining plains zebra populations, and that some quagga genes are still present ... though diluted and dispersed. "109Another possibility is that alleles for the chestnut colour do occur at low frequencies in plains zebra populations as suggested by Rau, but were not present in animals of the founder population; if so, they could not be recovered by selective breeding and would not be present in Rau quaggas. Klein and Cruz-Uribe observe, 'It would be comforting to think that its [the quagga's] essence lives on in the plains zebra, but our craniometric study suggests that something more unique may have been lost. '110What was true for cranial structure may also be true for coat colouration. We may learn more about this in future. Svante Pääbo, a leader in the field of paleogenomics, observed that it should be possible to identify the gene for the coat colouration of quaggas.111 This prediction, made long before the genomes of quaggas and all extant equines had been completely sequenced, could be tested by comparing the nuclear genomes of quaggas with those of plains zebras which have distinct black and white stripes over their whole bodies and which lack any brown colour. The alleles controlling chestnut coat colouration might then be apparent. Nuclear genomics of quaggas might also settle the question of whether quaggas had physiological adaptations to Karoo environments. A gene that helps plains zebras respond to unfavorable conditions has been identified;112 this or similar genes may well have been important for quaggas in the Karoo. Central to the Quagga Project was the vision of Reinhold Rau. He recruited support from others who had different views of the enterprise. First, there were molecular biologists for whom quagga DNA provided proof of concept that DNA of extinct animals could be sequenced. Quagga DNA, in turn, provided data necessary for taxonomists to reclassify zebras. This was particularly appropriate since Bowker and Star view classificatory schemes as boundary objects because of their ambiguity and flexibility.114 Revised taxonomy demonstrated that quaggas were conspecific with plains zebras, which was information essential for restoring quaggas. Rau then set about gaining the approval of various organisations, raising funds and initiating the Quagga Project. Attempts to restore quaggas have been widely covered in the South African press. The usual tone of the reports is inspirational but occasionally exaggerated, as when animals in the Quagga Project were said to represent 'a scientific miracle'.123 A more measured description came from Harley of the Quagga Project: 'It is quite a classic experiment in selective breeding. '124 Quaggas occurred only in South Africa and their extinction has weighed heavily on some of its people.125 Consequently, the sentiment of C. S. Lardner, head co-ordinator of the Quagga Project, is probably shared by many: 'it's good to know they're back and we haven't lost this animal that is thoroughly South African.126 Social scientists and cultural studies scholars have written about the Quagga Project in academic journals,127 but missing from most accounts is discussion of the opportunity costs: could the funds needed for restoration achieve more for the biota of South Africa if spent on conservation of endangered organisms, not just animals but also plants such as fynbos and succulents, many of which - as quaggas did - occur only in South Africa? Association with the Quagga Project may provide additional recognition for some enterprises, for example, the Wedderwill Wine Estate claimed bragging rights on its website: 'The owners of the Wedderwill Game Reserve are part of the quest of bringing back the Quagga. '128 And reality connects with the silver screen in the 2013 animated film Khumba, which features the eponymous quagga-like zebra: the film is dedicated to Rau, a Rau quagga foal was named Khumba, and Triggerfish Animation Studios, the movie makers, donated artwork for a noticeboard of the Quagga Project.129 Questions of identity - both his own as a white South African and of Khumba, whose lack of some stripes sets him apart from other zebras - helped the director, Anthony Silverston, formulate the film's concept.130 Identity also features in the similarities noted between the restoration of quaggas and the resurgence of South African culture.131 In both these instances, quaggas - virtual or living - serve as boundary objects in a more symbolic way to examine questions of personal or national identity. The founder of the Quagga Project is usually described as a taxidermist, but - as also noted by Swart132 - Rau was much more. The art of the taxidermist is to make dead animals look as lifelike as possible; incorporated into a diorama, these animals can help to represent habitats. The vision of Rau was to restore extinct animals; incorporated into their habitats, these animals can help to restore environments where the reduction of native grazing animals has resulted in indigenous vegetation being replaced by introduced plants.133 Appropriate degrees of grazing are often required for indigenous plants to survive: as John Comrie-Greig notes, quaggas were 'an important component of the karoo environment'134 and their extinction 'heralded major ecological changes to that environment.' Consequently, 'rewilding'135 of the Karoo with Rau quaggas as an integral component of the environment would be important. Of course, the introduction of plains zebra would serve the same purpose, but would not have the same symbolic significance. Several factors are involved in the environmental degradation of the Karoo including climate change, overgrazing and human activities such as mining.136 Although Don Boroughs was being overly optimistic with his pronouncement that 'The last, best hope for the fragile Karoo may be that one day it will be known as the place where the quagga was exterminated, only to rise again',137 Rau quaggas can be one part of environmental restoration. An important lesson of this account is that the Quagga Project can serve as a model for ways to bring together heterogeneous players to achieve a common goal. While Rau was pivotal, many other people and organisations were also involved. Moral duty, prestige, and making amends were among the various and overlapping reasons for giving support in cash and kind, and media attention throughout served to keep restoration of quaggas in people's minds. In short: the Quagga Project succeeded because it was a boundary object. Each of the stakeholders and parties involved had their own interests and perspectives, but all overlapped at the common goal, of restoring quaggas. The same model could be applied successfully to conservation projects. A counter example stands out. In Mozambique the Selous zebra, a 'rare, morphologically unique population'138 of the plains zebra, has suffered a precipitous drop in numbers: an estimated population of over 20,000 in 1970 had declined to fewer than fifty animals in 2000, 139 although their numbers have now risen slightly. This tragic situation appears to have gone largely unnoticed. Suppose that someone had advocated to rescue Selous' zebras, and with the 1992 end of the civil war a small population had been saved in Mozambique or outside the country. If someone with Rau's vision and determination had enlisted support from a heterogeneous array of people and organisations - biologists, conservationists, tourist bodies, and well-wishers of Mozambique - then the Selous' zebra might not now be critically endangered. What distinguishes the critically endangered Selous' zebras from quaggas, which are restored? The reworking of the taxonomic status of quaggas from a species to a subspecies was essential to the success of the Quagga Project. Taxonomic reform and political transformation created an opportunity that was taken up by well-developed scientific governmental and private institutions able to support the creation of a national symbol. Quaggas, with their history of victimisation and loss, provided the new South Africa with a symbol of restoration in the environmental realm. Sadly for Selous' zebras, postwar Mozambique has had no similar moment of reconstruction, and has fewer resources and weaker institutions. Not least, denied the status of a subspecies,140 Selous' zebras have no taxonomic standing to rally people around their conservation. In contrast, taxonomy based on macromolecules catalysed the restoration of quaggas. 1 I am grateful to the staff of the Transvaal Museum (Pretoria) and the Iziko South African Museum of Cape Town for their help. This research was carried out during sabbatical leaves funded by Brown University, and was aided by a fellowship from the Pembroke Center to participate in the seminar 'Values of Nature'. I thank Bruce Boucek for preparing Figure 1. I acknowledge appreciatively the comments of two anonymous reviewers and the editors in improving this contribution. 4 R.E. Rau, 'Revised List of the Preserved Material of the Extinct Cape Colony Quagga, Equus quagga quagga (Gmelin)', Annals of the South African Museum, 65, 2, 1974, 41-87; C.J. Skead, Historical Mammal Incidence in the Cape Province: The Eastern Half of the Cape Province, including the Ciskei, Transkei, and East Griqualand (Cape Town: Department of Nature and Environmental Conservation of the Provincial Administration of the Cape of Good Hope, 1987), 564. 14 C. Darwin, The Origin of Species (London: Murray, 1859), 167. 16 Harris, Portraits of the Game, 10. 18 Harris, Portraits of the Game, 14. 20 Harris, Narrative of an Expedition, 308. 23 Independent (South Africa), 23 July 2014. 28 Bryden, Kloof and Karroo, 401. 29 New York Times, 9 January 1887. 30 Editor, 'Act for the Better Preservation of Game', African Wildlife, 37, 4, 1983, 135. 31 Bryden, Kloof and Karroo, 402. 32 J. Comrie-Greig, 'The Quagga and the Taxidermist's Art', African Wildlife, 37, 4, 1983, 141; [ Links ] Rau, 'Revised List, 41; R.E. Rau, 'Additions to the Revised List of Preserved Material of the Extinct Cape Colony Quagga and Notes on the Relationship and Distribution of Southern Plains Zebras, Annals of the South African Museum, 77, 2, 1978, 27-45. 34 Cape Argus (South Africa), 8 March 1952; Skead, Historical Mammal Incidence, 567. 36 Skead, Historical Mammal Incidence, 564. 39 Heck, Animal Safari, 84. 43 C. Darwin, 1838. Notebook C #145, http://darwin-online.org.uk/content/frameset?keywords=quagga&pageseq=129&itemID=CUL-DAR122.-&viewtype=text. 48 F.C. Selous, 'Burchell's Zebra' in HA Bryden (ed), Great and Small Game of Africa: An Account of the Distribution, Habits, and Natural History of the Sporting Mammals, with Personal Hunting Experiences (London: Rowland Ward, 1899), 79-84; [ Links ] Rau, 'Revised List', 41. 50 Rau, 'Revised List', 41, Larison et al, 'How the Zebra Got Its Stripes', 140452. 52 Rau, 'Revised List', 41. 56 Cape Towner, 2 March 2006. 57 Los Angeles Times, 30 August 1998. 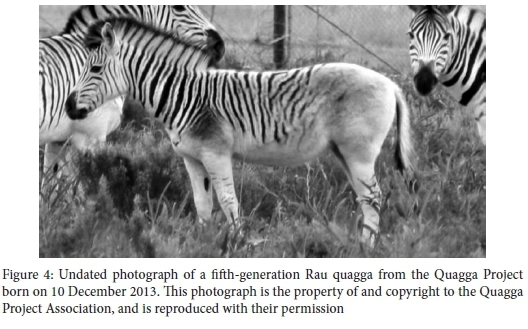 58 R. Rau, 'Rough Road Towards Re-Breeding the Quagga: How It Came About' (Unpublished manuscript, 1999, indexed as z.30.9.65, Iziko South African Museum Library, 1999). 59 Harley et al, 'Restoration of the Quagga', 78. 60 Rau, 'Rough Road', 2. 63 Klein and Cruz-Uribe, 'Craniometry, 81. 65 Higuchi et al, 'Mitochondrial DNA', 283. 67 Jónsson et al, 'Speciation', 18655. 70 Groves and Bell, 'New Investigations', 2004. 71 Rau, 'Revised List', 41; Rau, Additions to the Revised List, 27; Rau, 'Rough Road', 2. 72 L. Orlando, A. Ginolhac, G. Zhang, D. Froese, A. Albechtsen, M. Stiller and M. Schubert, 2013, 'Recalibrating Equus Evolution Using the Genome Sequence of an Early Middle Pleistocene Horse', Nature, 499, 7456, 2013, 74-8. 73 Jónsson et al, 'Speciation', 18655. 75 Rau, 'Rough Road', 2. 77 Rau, 'Revised List', 41; Rau, Additions to the Revised List', 27; Rau, 'Rough Road', 2. 80 Rau, 'Rough Road', 9. 83 http://www.quaggaproject.org/quagga-coordination.htm. Although this plan is labelled 'draft', there is no other version on the Quagga Project website. 84 Harris, Narrative of an Expedition, 378. 85 Harley et al, 'Restoration of the Quagga, 78; R. Parsons, C. Aldous-Mycock and M.R. Perrin, A Genetic Index for Stripe-Pattern Reduction in the Zebra: The Quagga Project', South African Journal of Wildlife Research, 37, 2, 2007, 105-116; http://www.quaggaproject.org/Quagga-Graphic-Elements/PhotoGallery/PhotoGallery/slide.html. 86 Farmer's Weekly (South Africa), 21 March 2014. 87 Klein and Cruz-Uribe, 'Craniometry, 81. 88 Jónsson et al, 'Speciation', 18655. 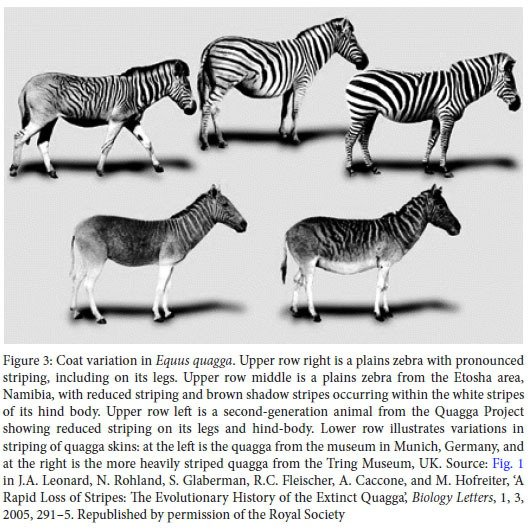 89 B. Lundholm, 'Is Rebirth of the Quagga Possible? ', African WildLife, 5, 3, September 1951, 209-12; Thamm, 'Rebirth of the Quagga', 209. 90 Peter van Bree, quoted in New York Times Magazine, 1 January, 2006. 91 W.R. Siegfried, 'Human Impacts' in Dean and Milton (eds), Karoo, 239-41. 92 Meadows and Watkeys, 'Paleoenvironments', 36, 37. 94 Anon, 'Update on the quagga project, African Wildlife, 52, 2, 1998, 9. 96 Rau, 'Revised List', 41; Rau, 'Additions to the Revised List', 27. 98 Quagga Project Committee, 'Quagga Breeding Project: The Aim', Mane, 4, March 1997, 2. 100 Jónsson et al, 'Speciation', 18655. 104 Harley et al, 'Restoration of the Quagga', 80. 109 Weekend Argus (South Africa), 12 February 1994. 110 Klein and Cruz-Uribe, 'Craniometry, 81. 111 New York Times, 25 June 1991. 112 Jónsson et al, 'Speciation', 18655. 113 S.L. Star, and J.R. Griesemer, 'Institutional Ecology, Translations and Boundary Objects: Amateurs and Professionals in Berkeley's Museum of Vertebrate Zoology, 1907-39', Social Studies of Science, 19, 3, 1989, 387-420. 115 Argus (South Africa), 27 July 1993. 116 Argus Northern (South Africa), 25 March 1998. 117 Barnaby, 'Karoo', 94; Star (South Africa), 3 July 2000. 119 Argus, 17 September 1987. 120 Sunday Times (South Africa), 26 September 1993. 121 Los Angeles Times, 30 August 1998. 122 Rau, 'Rough Road', 2. 123 E. Levitz, 'Who Cares? : He Does', Publico, 14, 1, February 1994, 7-9. 124 Argus, 17 September 1987. 125 Skead, 'Historical Mammal Incidence', 563. 126 Farmer's Weekly (South Africa), 21 March 2014. 127 R. de Vos, 'Stripes Faded, Barking Silenced: Remembering Quagga', Animal Studies Journal, 3, 1, 2014, 29-45; C. Freeman, 'Ending Extinction: The Quagga, the Thylacine and the "Smart Human'" in C. Gigliotti (ed), Leonardo's Choice: Genetic Technologies and Animals (New York: Springer, 2009), 235-56; S. Swart, 'Frankenzebra: Dangerous Knowledge and the Narrative Construction of Monsters, Journal of Literary Studies, 30, 4, 2014, 45-70. 129 http://www.quaggaproject.org/index.htm, February 2014 co-ordinator's report. 135 Kolbert, 'Recall of the Wild', 50. 136 M.L. Masubelele, M.T. Hoffman, W. Bond and P. Burdett, 'Vegetation Change (1988-2010) in Camdeboo National Park (South Africa), Using Fixed-point Photo Monitoring: The Role of Herbivory and Climate, Koedoe, 55, 1, 2013, 1-16. 140 Beilfuss et al, 'Status and Distribution', 47.